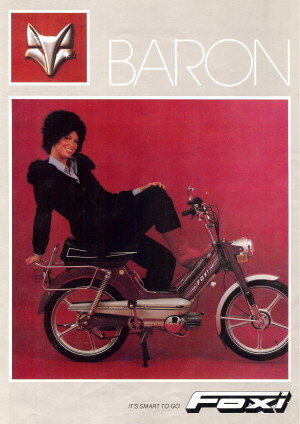 The model names “Salzburg” and “Baron” were not on the bikes anywhere. 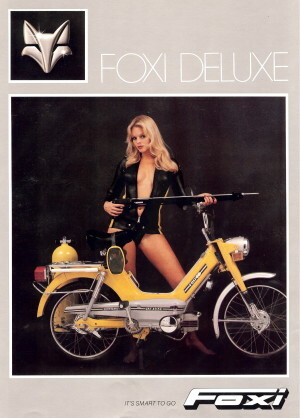 Instead all three models were labeled as “Deluxe”. So only Foxi owners that had this brochure called their bikes Deluxe, Salzburg, or Baron. 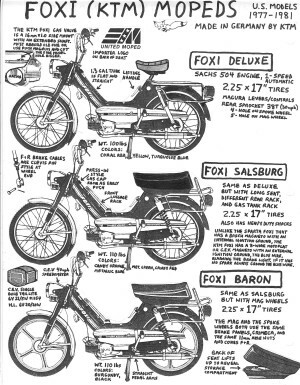 Every one else called their bike Foxi Deluxe, because that is what it says. 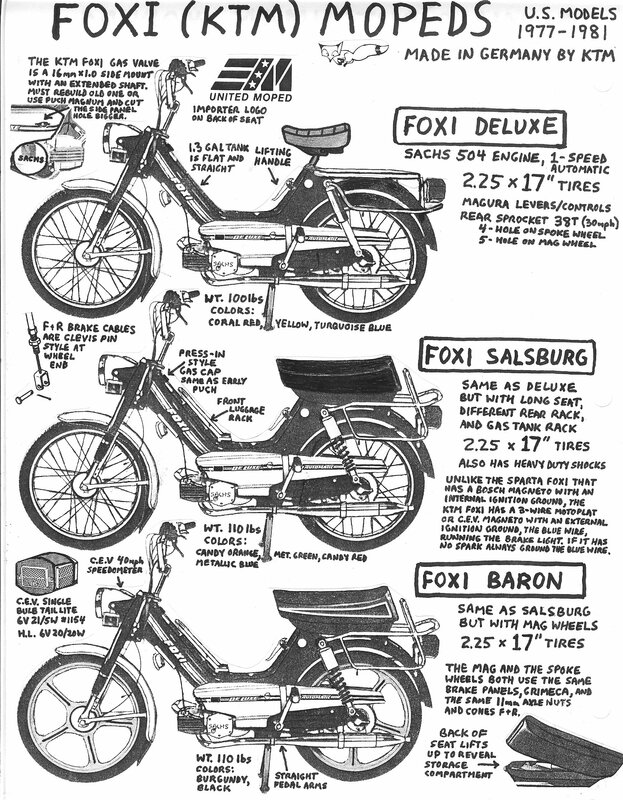 So in a way, there are three kinds of Foxi Deluxe: Foxi Deluxe, Foxi Deluxe (Salzburg), Foxi Deluxe (Baron). The KTM mopeds are made in Austria. 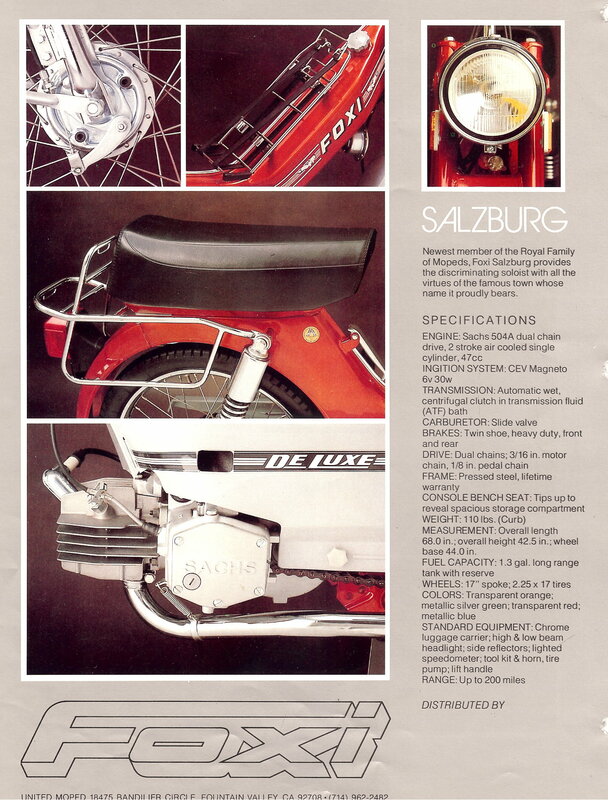 KTM is similar to it’s Austrian cousin, Puch. 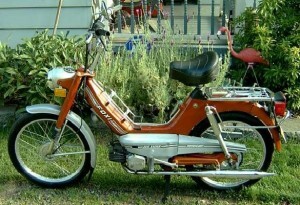 The KTM frame is made for a Puch engine, but has an adaptor bracket for a Sachs 504 engine. 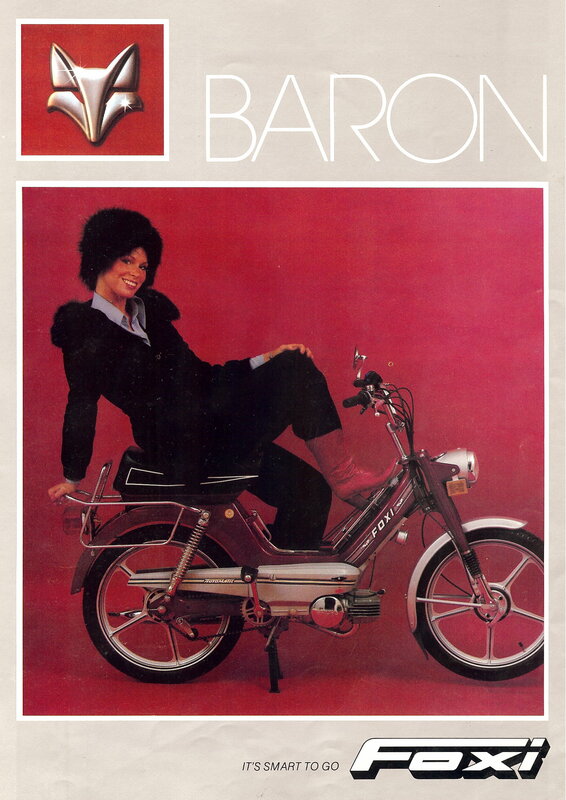 The frame looks like a Puch Maxi. The following parts are the same on a KTM Foxi and a Sparta Foxi: Sachs 504 engine, CEV headlight, Magura levers, CEV switches, and possibly the CEV horn. the CEV magneto 80mm 3-wire with an external ignition ground (blue wire), not Bosch 4-wire with internal ignition ground. 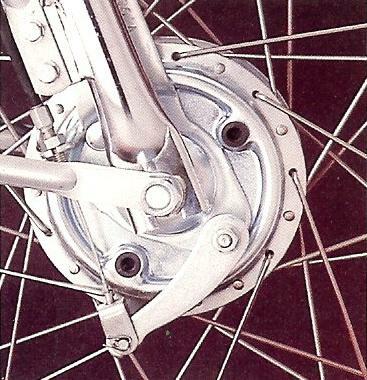 the 17″ rims with Grimeca hubs and brakes, not 16″ rims with Leleu. 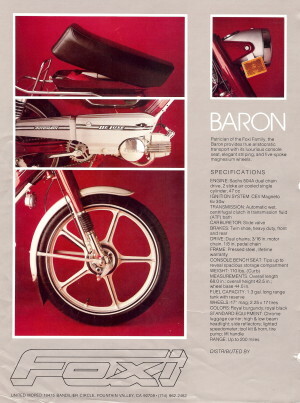 The rear brake plate is specific to KTM and Hercules and is rare because it gets bent. the brake light wiring, normally closed switches in series, not normally open switches in parallel. 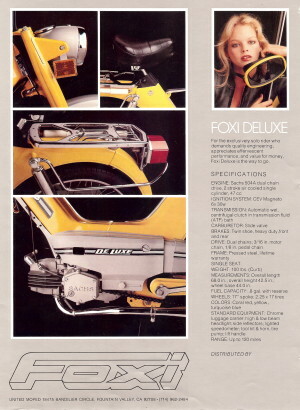 See Service/Electrical/Wiring Diagrams/KTM Foxi for more info. KTM Side Covers: The KTM light grey chain gaurds, aka engine covers, are two pieces on each side. The back pieces are fixed to the swing arm. 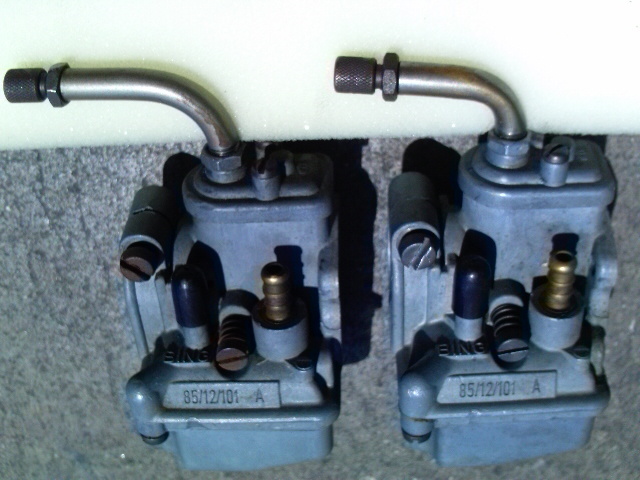 The front pieces, aka “side covers”, detach by quarter-turn plastic fasteners. They say “De Luxe” within the black horizontal stripe. They are what gets lost and are not available, sorry. 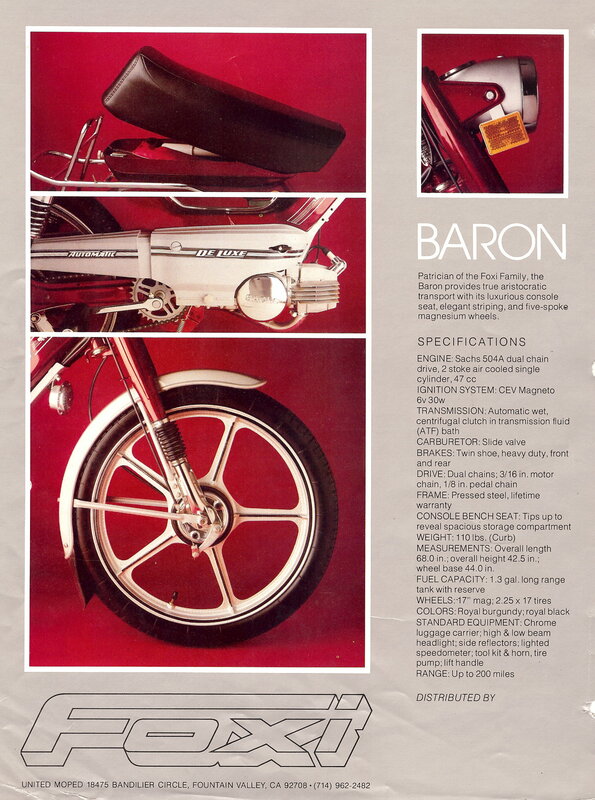 However, Myrons has most of the screws and fasteners, and the rear chain gaurd pieces. Myrons sells Puch Maxi side cover sets, used for $40 and new repros for $55. They don’t fit KTM that well though. 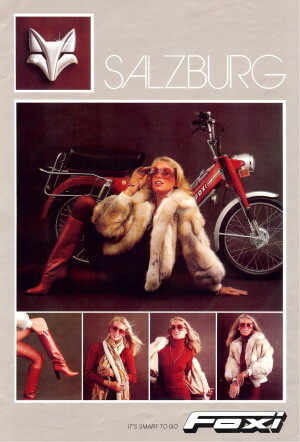 All the vintage moped covers are scarce, except for Puch. KTM Gas Cap: 30mm push-in, see gas caps. Some frame rails, shocks, luggage racks, forks, fenders, are available but not listed here, yet. KTM Throttle Cable double ended, longer wire than Sparta, for long carb elbow original on KTM. You are currently browsing the archives for the KTM Parts category.